Published on April 6, 2018. We were greatly saddened yesterday to hear of the demolition of a historical Epsom Primary School building. The reasoning behind the buildings demolition has been documented by the Bendigo Advertiser, accessible here. 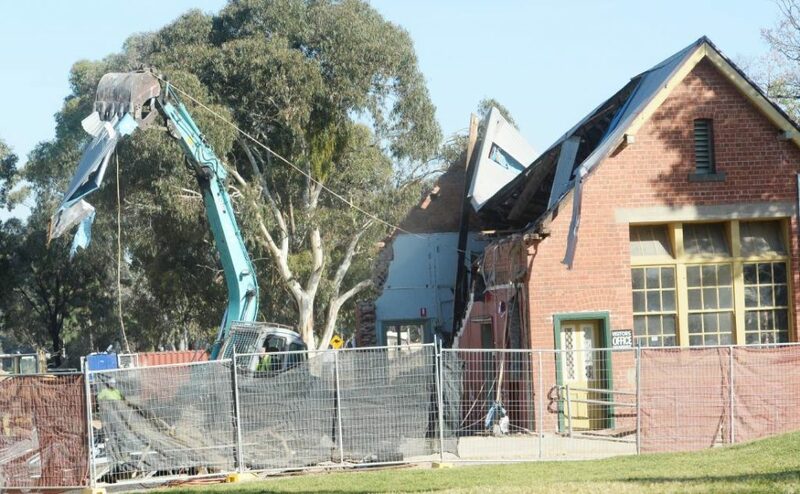 The National Trust contacted the Victorian School Building Authority at the end of last year objecting to the proposed demolition of the building after being alerted to the plans by members of the National Trust Bendigo Branch and other community members. We strongly opposed the demolition of the building due to its identified heritage value and its historical significance to the local community. The “White Hill and East Bendigo Heritage Study—Stage 2, 2016” identified Epsom Primary School as being of “local historic, aesthetic and social value to the City of Greater Bendigo”. We note that a Heritage Overlay for this building was exhibited in November/December 2016, and that Amendment C223 to the planning scheme was adopted by the City of Greater Bendigo on 15 November, and has now been referred to the Minister for Planning for permanent controls. It is our understanding that no submissions objecting to the proposed Heritage Overlay for the Epsom Primary School building were made during the amendment process, which had provided the community with a level of comfort that the building would be protected. The heritage study identified the school building as a “symbol of community pride” as it has served as an important local institution since early settlement with strong connections to the community across generations. It is considered a “prominent landmark building in Howard Street” and surrounding streetscape, which is of particular significance in an area where little heritage remains. Further, the Elm trees associated with the Epsom School building enhance the heritage value of the building. In light of the building’s identified heritage value and significance to the local community, the National Trust believes that the building should be retained within the redevelopment of Epsom Primary School. The National Trust is very disappointed by the demolition of this 137-year-old building, and will be making further enquiries with the Victorian School Building Authority.